This restorative dentistry course how to implement a process of occlusal therapy within their dental practice. Equilibration is a cornerstone for treatment of occlusal disease, and as such, any dentist who wishes to practice complete dentistry must know how to perform all aspects of it correctly. As a participant, you will discover the importance of the trial equilibration and be given the opportunity to adjust several different case types to ensure your complete understanding of the material presented. This complete dentistry dental continuing education course includes lectures, videos of patient treatment, and hands-on exercises to provide you with the knowledge and confidence to return home and implement occlusal treatments in your practice on Monday morning. The examination and accompanying records are the ﬁrst steps in the process of complete dentistry. This hands-on program will cover all aspects of the exam and records process. 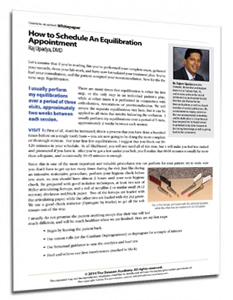 Recognize when to equilibrate your patient, and when other options should be considered. Class Hours: Day 1 and 2 – 8:00 a.m. to 5:00 p.m. Day 3 – 8:00 a.m. to 3:00 p.m.
Really worthwhile to go through the training to understand how to properly treat these more complex cases. You have to stick with the program and adhere to the recommendation in order to get the full benefits out of it. I’m very glad I’m investing in this level of training at an early stage in my career. The thought process of negotiating between combinations of additive and reductive equilibration opens up more possibilities of ideal dentistry with minimal invasiveness. I have attended many courses. This one was great and I look forward to attending many more Dawson Courses. The course content was great. This is a course you must take to be able to offer excellent care for your patients. I’ve come to realize that without getting the joints stable first all other care we provide is unstable and will fail over time. Following proper diagnosis and treatment planning, occlusal equilibration can provide selected patients with the most conservative, predictable, and safest treatment possible. Occlusal equilibration can also help avoid the need for more complex treatments.